Stand out from the crowd with this distinctive Multi Color Acrylic and Jewel Toned Glass and Gold Plated Bib Necklace and Earring Set. It features a bib design necklace designed as a cascade of dangles in crystal hues of purple, fuchsia , amber and black jet drops. They are connected to the gold plated necklace and come with matching gold plated dangle earrings for a unique look. 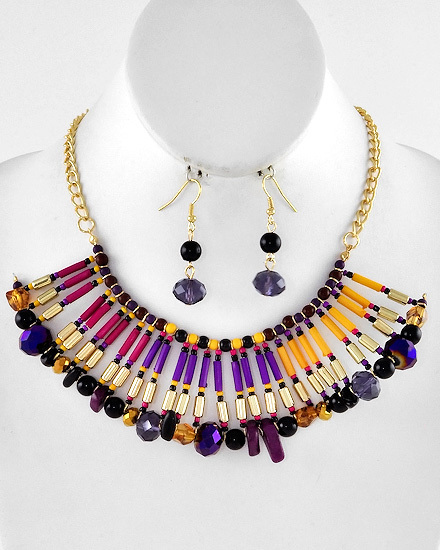 Gorgeous Gold Plated Necklace / Multi Color Acrylic & Purple Glass drops and Matching Earrings.